This post is well over do.. 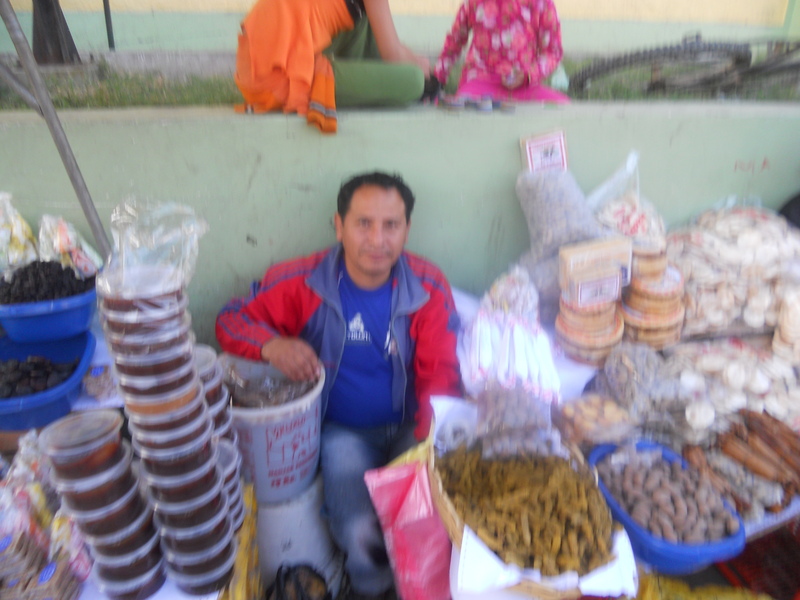 Please read Mountain Sized Sand Doons, Doon buggy, Morenas from Chincha, Ceviche and more! Part I before you read this one =). 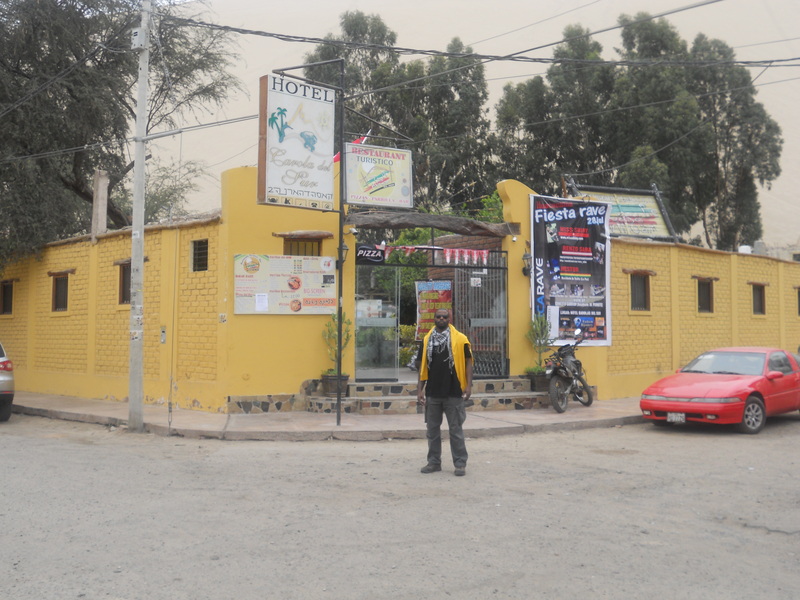 Matthew and I had an amazing time in Chincha it was now time for us to jump on the bus again and headed towards Ica to make our way to Huacachina. http://www.huacachina.com/ (the funny thing is, is that this is the first time I’ve looked at this website lol). While we were on the two-hour bus ride they played in “The Pursuit of Happiness” in Spanish; a few ladies selling Peruvian snacks, sandwiches, and gaseosas (sodas) came on board. We arrived at the Ica bus station hailed a cab and we were off to Huacachina! We rode through the town of Ica for about 5 minutes and then out of nowhere these huge sand dunes the height of sky scrapers appeared. They were absolutely amazing. We pulled up to Huacachina which is actually a dessert oasis not really much of a town outside of the hotels and restaurants surrounding the lagoon and we felt like we were in a movie.We began our search for hotels by first going to the higher priced hotels listed in Lonely Planet and then working our way down. Unfortunately this was the Peru’s Independence Day weekend which meant the hotels were all full and were double the price. Apparently all of Peru wanted to go where we were going =). First we went to Salvatierra which was listed in Lonely Planet Peru (otherwise known as “the book”) and people’s trip reports at the South American Explorers Club (SAE) they were sold out; then El Huacachinero http://www.elhuacachinero.com/ which has there own doon buggies they were sold out; then Hosteria Suiza which is supposed to be one of the nicer hostels, they had a room for about S./300 soles (a little over $100.00 but we were already used to soles) it looked descent but way to much, we said we would be right back while we looked for another hotel. We felt like Mary and Joseph looking for a place to stay but no one would take us in. We finally found a hotel (well I should say hostel) the Carola del Sur a.k.a Casa de Arena II that was somewhat descent and they promised not to book the third bed in our room. We had a shared bathroom that we weren’t able to see until after we booked the room because the other guest had it locked. Once we saw it we knew our next shower would be in Lima. At that point it was around 3pm and we figured lets not waste the day and find something to do. I went to a place that was recommended in the SAE guide Desserts Nights and we booked a wine tour that would leave 20 mins later, and doon buggies and sand boarding for the next morning. 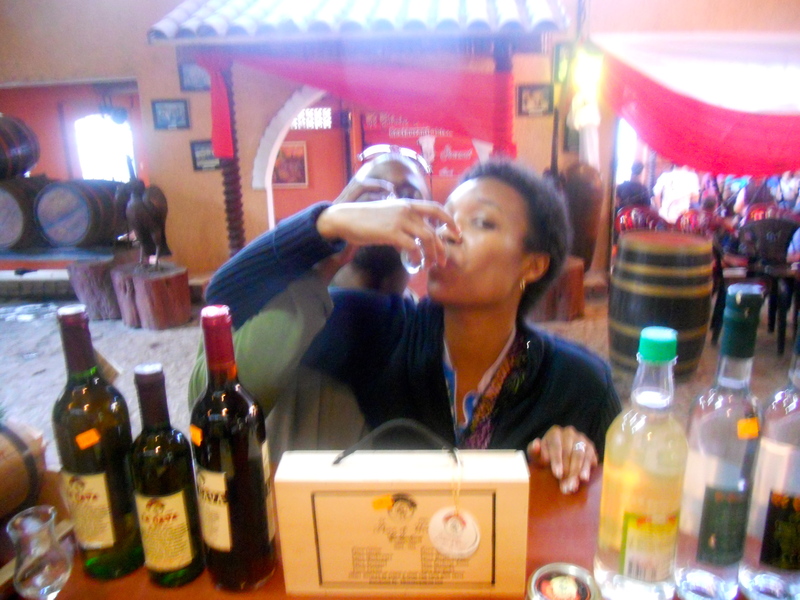 It was great we got to taste tons of Pisco and Wines, and the “bodegas” were quite interesting. After the wine tasting we went in search for dinner and ended up at Hostel Sand and Lake. I had some pretty good fried fish and of course a Pisco Sour. 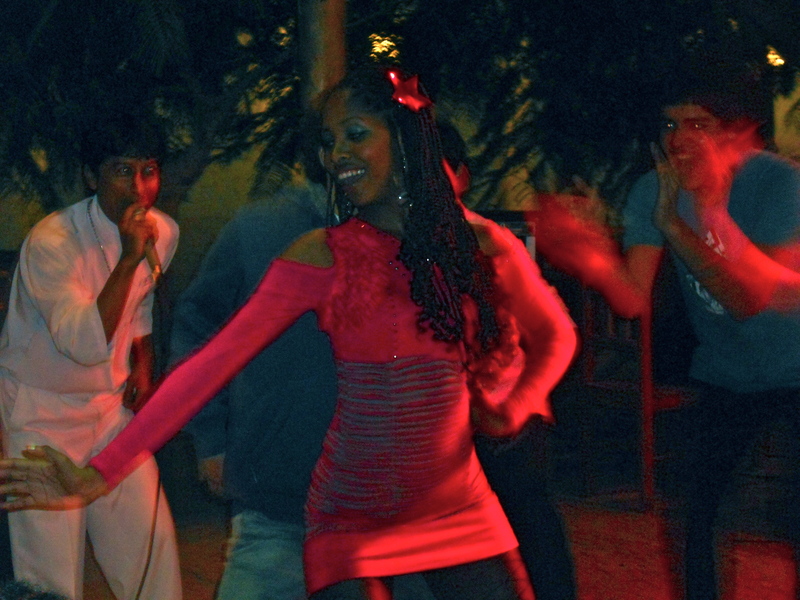 The people there were pretty nice, they told us about a party at Casa de Arena. 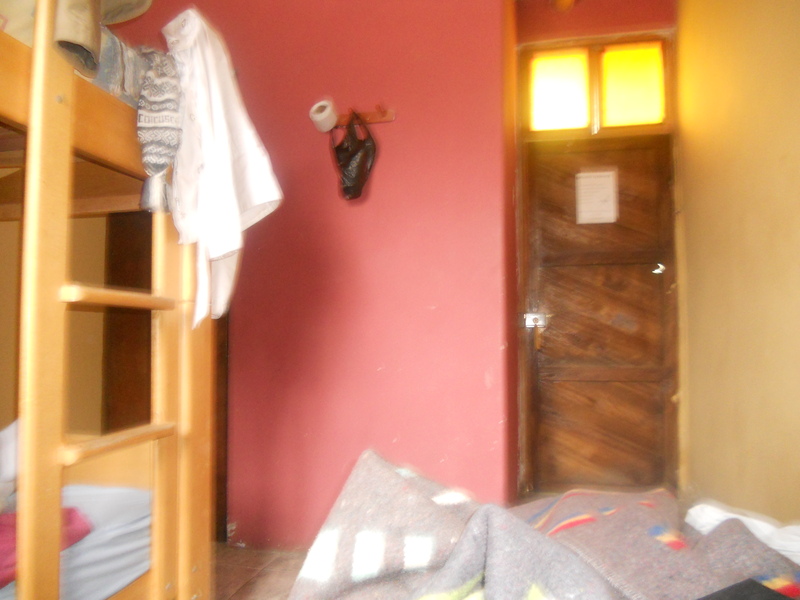 We then took a walk around town and headed back to our hostel for a nap. Oh nap did I say – that was impossible as our fellow backpackers that shared a bathroom with us decided to blast Israeli club music. Our room had a bunk bed and single twin beds in the room; however, both of the beds on the bunk bed had a so thin layer of sand. So we slept on the same twin bed together. Yes, we have learned we are not backpackers and we decided on staying for just one night instead of two. 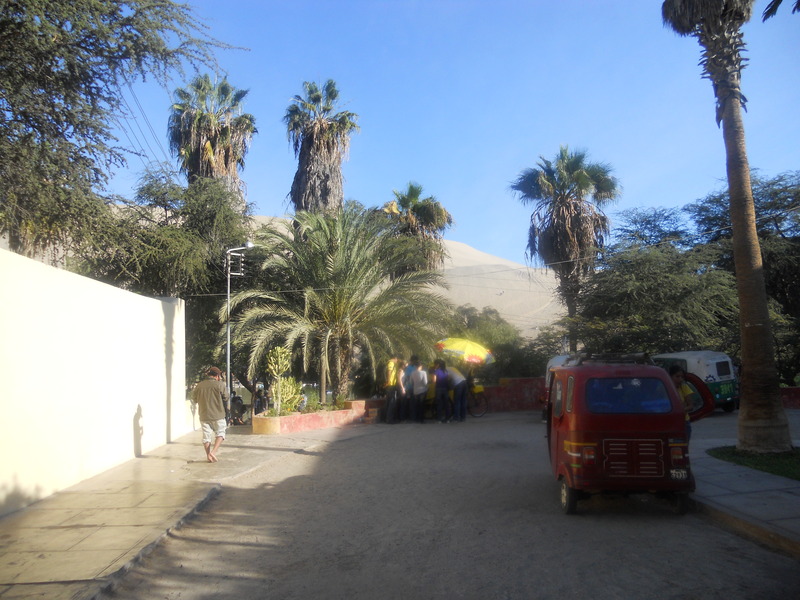 We headed to Casa de Arena (FYI arena means sand in Spanish) and there wasn’t too much going on so we just walked around Huacachina some more. Matthew had some pizza at the little restaurant at the hotel and we headed to bed. I have to mention that the restaurant only had alcoholic beverages available to sale at that time about 3am even though they had some sodas to mix with their drinks smh. The next morning after we woke up I wrapped up my hair to protect it from the sand and we headed over to Dessert Nights for breakfast, doon buggy riding, and sand boarding. I ordered a pretty darn delicious omelet with asparagus, tomatoes, cheese and mushrooms. 5 mins later there’s a guy that pull up to the restaurant on a motorcycle and all the servers are placing there orders with him. 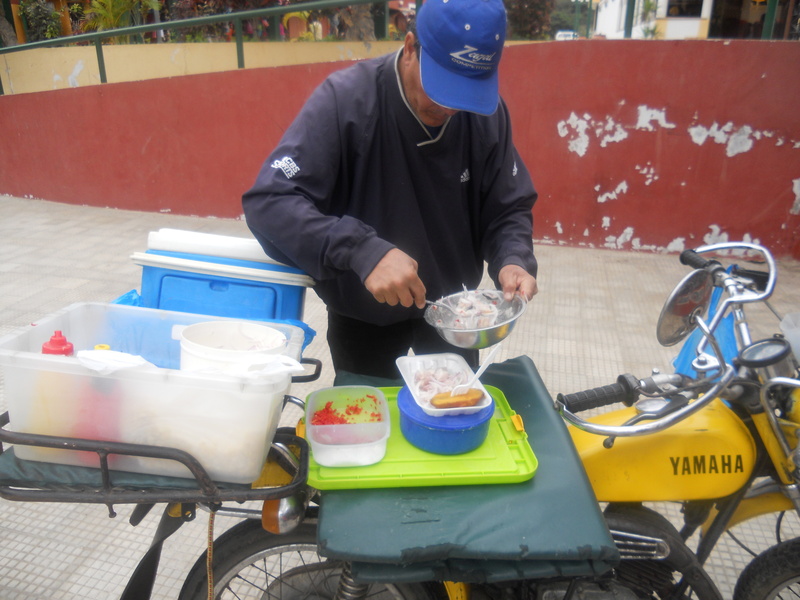 Of course I ask what this is all about – he’s selling fresh ceviche from Paracas. It was only S./8 so of course I ordered some as Matthew laughed at me. 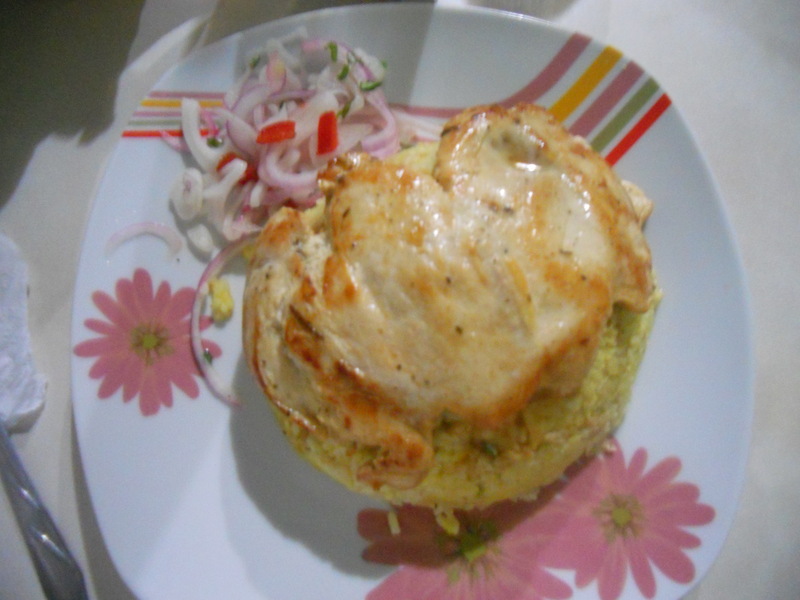 I can’t help it I’m a foodie =). So I only ate half my omlet and all of my pescado ceviche and Matthew was starving after our doon buggy adventure. We finished up our breakfast and then got strapped into our doon-buggy. OMG . 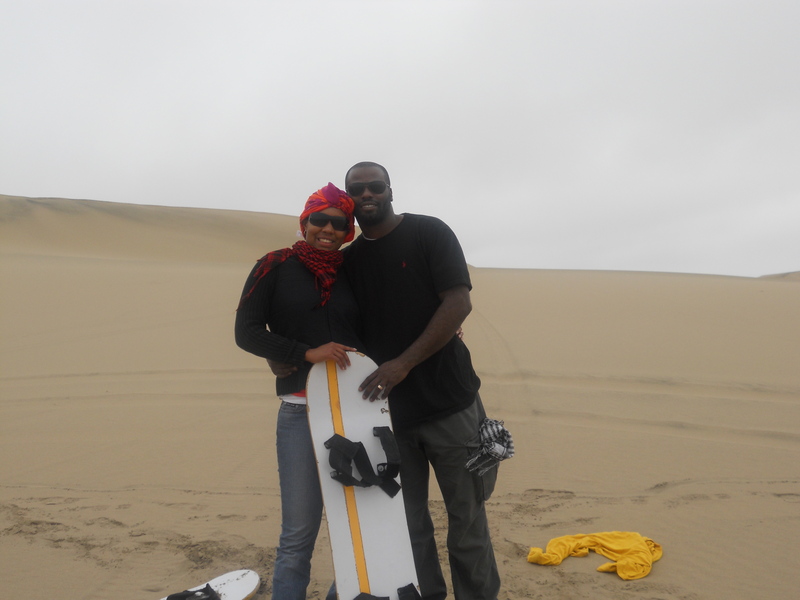 if you are ever in Lima and you have the time to head to doon-buggies and sand boarding in Huacachina is a must! We had the time of our lives =) Well they say pictures are worth a thousand words so please take a look at more of our pictures here: photos. After that we checked out of our hotel and hopped in a moto-taxi (a three wheeled taxi basically a motorcycle with a third wheel) and headed to Ica to buy our bus ticket back home to Lima. 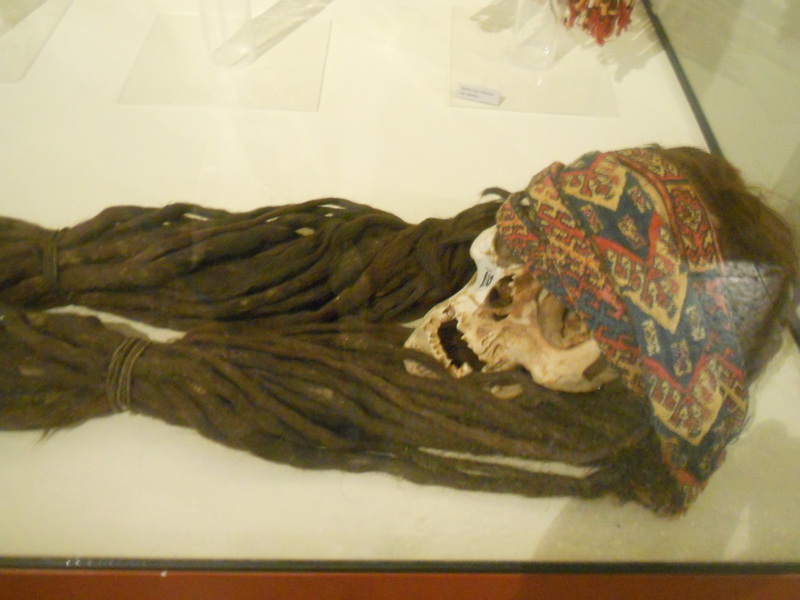 We stopped by the Ica Regional Museum – they have a lot of mummies, pottery, textiles and a replica of the Nazca Lines. 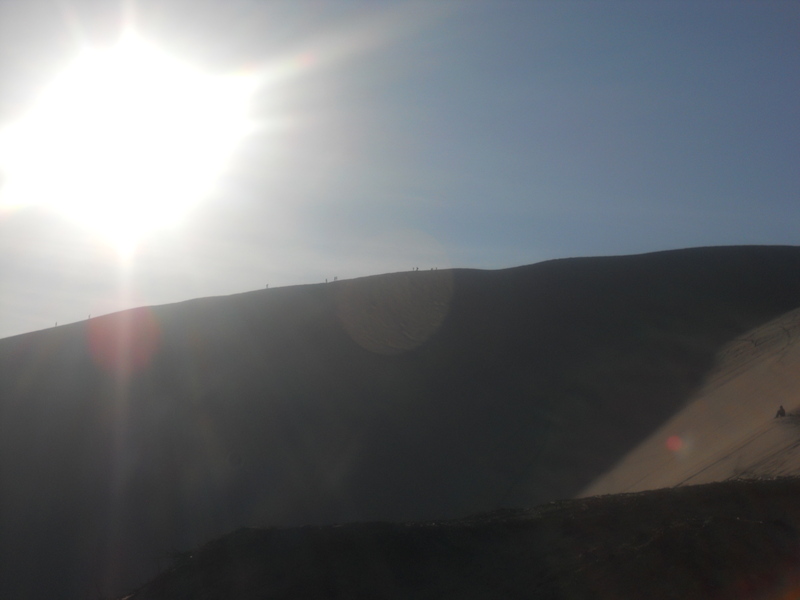 While there we met a guy from Paracas who told us when we come back to call him, he’ll pick us up and show us around =). After that we headed to Ica’s central plaza so that Matthew could grab some lunch. 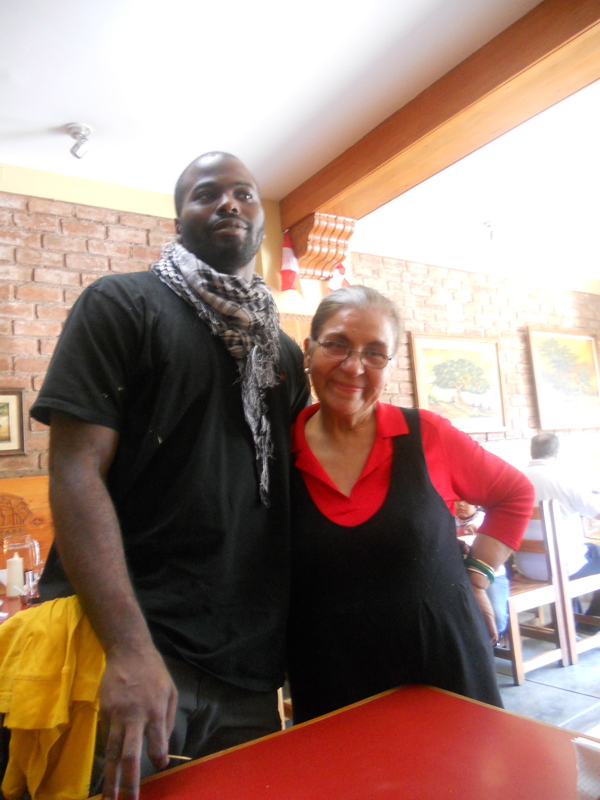 We ended up at Plaza 125 – Matthew had the Tacu Tacucon bistek y salsa criolla. After lunch the owner of the restaurant came over and talked to us – she is so sweet. We jumped on the bus and luckily purchased the “Ejecutivo Class” seats for S./3 more then regular and had a lot more leg room this time. 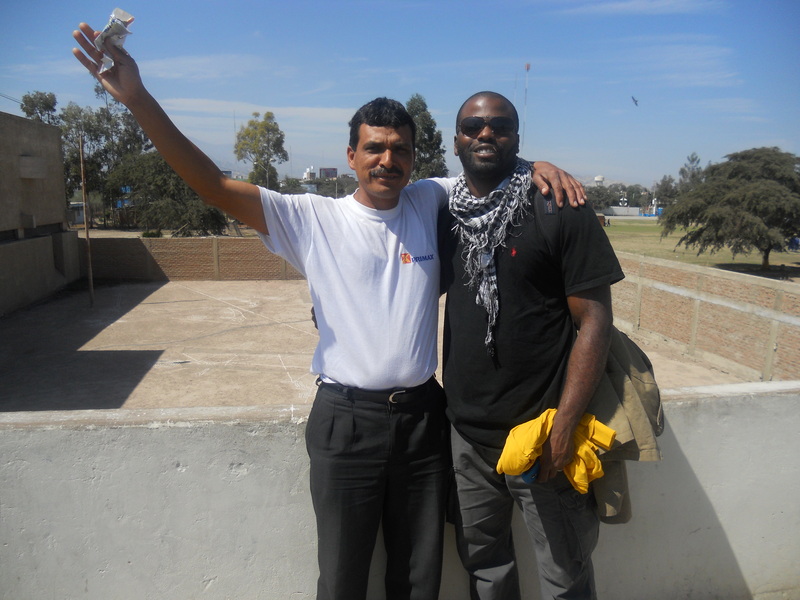 We arrived back to Lima went to grab our bags ……. oh here we go.. my bag was gone. Nothing we can do about it – lesson learned backpack under our seats.